Murder and mystery in Restoration England! Perfect for fans of C. S. Quinn, S. G. MacLean and Alison Weir. Life should be good for Major Thankful Russell and his new bride, Thomazine. Russell, middle-aged and battle-scarred, isn’t everyone’s idea of the perfect husband for an eligible young woman but the moment Thomazine set eyes on her childhood hero, she knew they were destined for one another. But Russell, a former Roundhead, now working for the King’s intelligence service, was never going to have a simple life in Restoration London. Unable to shake suspicions of his Parliamentarian past, someone seems hell-bent on ruining his reputation — and his life. Whispers about his sister’s violent murder follow him and accusations of treason abound. When more deaths occur Russell finds himself under suspicion. He is ready to escape from the capital, but Thomazine is determined to find the truth and clear the name of the man she loves. But who is the real killer and why are they so keen to frame Russell? More importantly, will they succeed? And has Thomazine’s quest put them all in mortal danger? 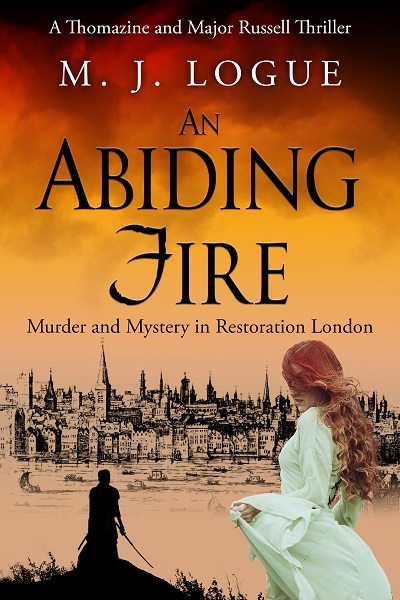 An Abiding Fire is the first book in the Thomazine and Major Russell Thriller series, compelling historical mysteries with a dash of romance, set in seventeenth century England.